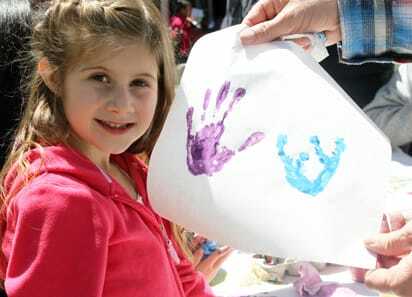 "CATCH" Hand Differences Program at Children’s Hospital Los Angeles is a community designed for children of all ages with missing, small or weak arms, hands or fingers. The program is open to all patients who receive care through the hospital's Hand and Microsurgery Program. With donations from generous supporters, CATCH staff host events and develop supportive programs for children who have hand and upper extremity disorders. This day-long picnic is fun and educational. Arts, crafts and music activities are specifically designed to accommodate the needs of this special group of children. CATCH provides lunch for patients and their families around large tables in a wide-open environment to encourage socializing and relationship building. The event includes educational lectures from orthopaedic surgeons, occupational therapists, nurses, prosthetists and social workers. Handy Heroes Therapy Camp is the only camp of its kind within the greater Los Angeles area. Created and led by the Occupational Therapy program at Children’s Hospital Los Angeles, the camp is designed specifically for children with cerebral palsy, a condition which often limits a child's ability to use one side of their body (especially the hand on the affected side) due to lack of strength, coordination and motor skills. Camp provides physical, psychological and social benefits and creates a sense of acceptance, unity and empowerment among campers. The opportunity to participate in a camp experience with children who have similar challenges is priceless. Visit the Handy Heroes Therapy Camp page for more information. "CATCH" Hand Differences Program is currently raising funds to provide scholarships for musical instruments, sports adaptive equipment and prosthetics to patients and families who cannot participate in most play activities without them. One-handed keyboards and iPads are just a few of the items that can help these children express themselves as artists, musicians, engineers and athletes. CATCH provides children with specialized toys that help them develop and make the most of their abilities.